The rain battered my hotel’s roof so hard that it sounded like a gusting wind, and I loved it. The rain and I have always been muy simpatico, and I feared that I might miss it since I was arriving in Thailand after monsoon season. Yet here was a delightful downpour, so torrential that it woke me from my sleep. 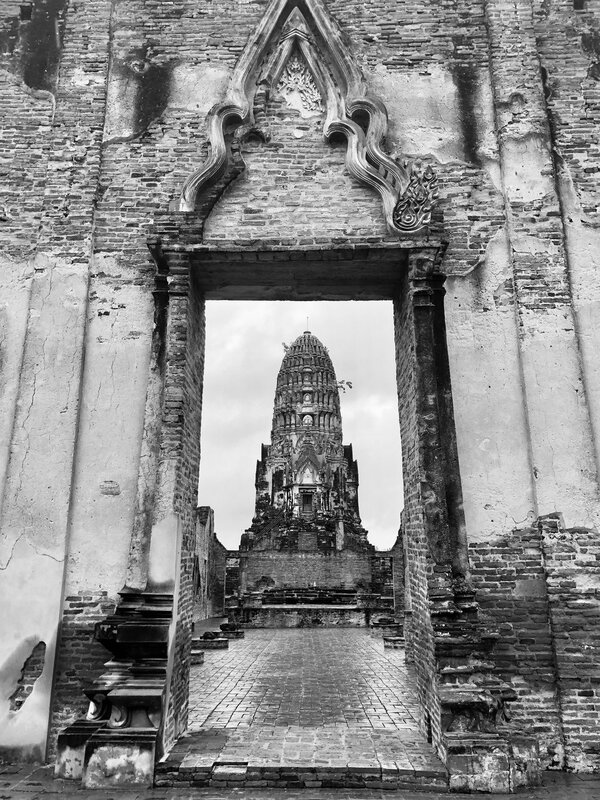 This is my third day in Ayutthaya. While the guidebooks say that you can see everything in a day, I’m finding that grokking just two temple compounds is taking all my time. Within walking distance of my hotel are Wat Rachaburana and Wat Mahathat. Wat Mahathat, which I visited my first and second days, is best known for being the home of the sandstone Buddha head encased within tree roots. I had always thought that this site was located in Cambodia, but instead, it’s here in Thailand. It is incredible to see, though while many surrounded the Buddha’s head for selfies, I moved on to the other areas of the compound. I find this place speaks more loudly to me than the temples in Bangkok did. 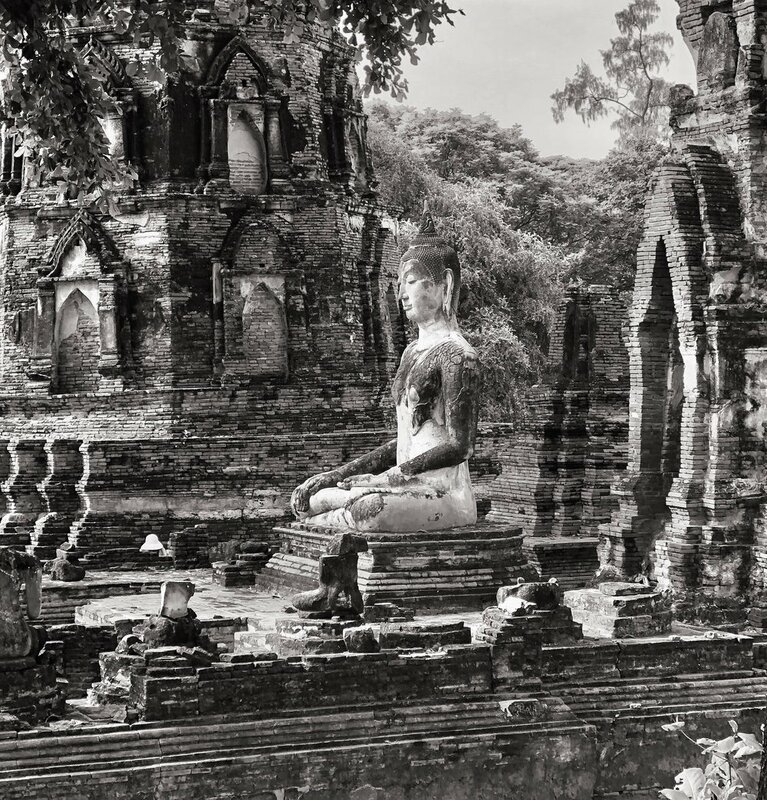 Perhaps it has to do with age, since these sites are the same age as Angkor Wat, though I suspect that my love of rocks has much to do with it since all the Buddhas, and Buddhas’ fragments here are made of stone. These relics still emit a gravitas that can be felt profoundly if you wait quietly next to them. While Wat Mahathat has several intact stand-alone Buddhas (such as the one above), Wat Rachaburana has none that I found. Instead, there are fragments everywhere from when the site was plundered. The Buddhas are often beheaded, or missing their torsos, or just sets of legs. What kept me returning was the prang in the center of the compound, and I circled it repeatedly hoping to decipher its iconography. The prang is square with four Garudas, one on each side. Garudas act as a protective spirit that looks like, in this case, a human size bird-like creature. They had huge chests, feathers on their arms, and five serpents at their feet. The Garuda is the enemy of the serpent, and I assume that the snakes are trapped in its talons. Immediately to the left and right of the Garuda appear to stand Yakshas, which are also protection spirits, ferocious looking with bulging eyes, protruding fangs, and swords. They protect temple entrances. Next to the Yakshas appeared to be three Buddhas, preaching. Beneath the Buddhas, Garudas, and Yakshas are more serpents, these in groups of four. And finally, at three faux entrances, are Buddhas, posed in the Abhaya Mudra, a position that imparts fearlessness, two with their left hands raised, and one with its right. As I walked around and around the prang for an hour, I’m not sure if the grounds people thought that I was bananas or were thankful that somebody was trying the understand the relic. With each pass, I see more. I certainly don’t understand the iconography of the prang yet, and I have a lot of research to do. But what an experience! In my previous post, I said that I was giving up photography, and that hasn’t proven to be true. However, I have become mindful about the photographs I take, usually not photographing until after I spend time with an area, making far fewer pictures, and journaling about my experiences much more. In that way, the photographs illustrate my observations rather than replace them. I’ll continue tracking my experience to determine whether photography is interfering with them or not.